In the rush to get the latest releases on sale (and to get outside to enjoy the sun!) I neglected to update the blog. There really was a lot to do - checking and bagging all the stock that arrived that morning amongst other mundane things - and it really was very, very sunny... Anyway, on to the new releases! 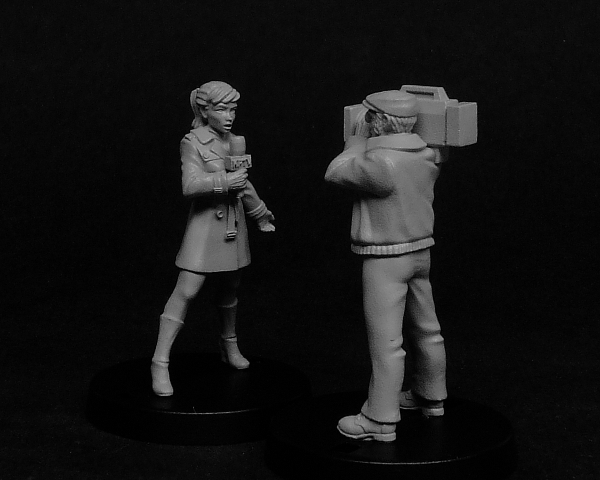 First up of the new releases are Tallulah Caine and her trusty cameraman Carter. These figures are something of an update of the news TV news team I sculpted for the Frothers Unite sculpting competition in 2009. They were only available briefly in the winners set and since then I've been asked a number of times what happened to them, so I thought I better finally sculpt some replacements! 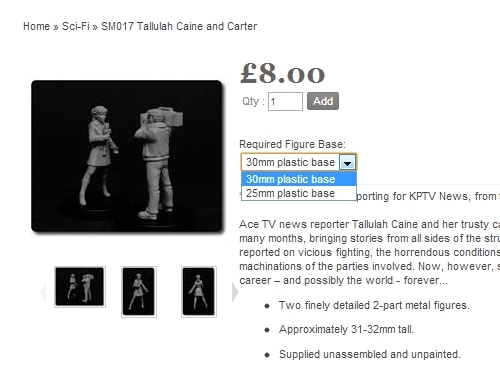 Tallulah Caine and Carter are priced at £8.00 for the set and as usual there are discounts for multiple purchases. Head over to the shop to pick up your news team! 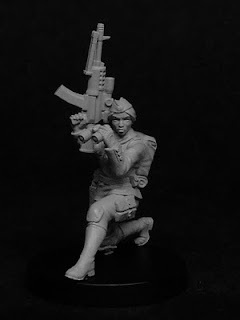 Next is the release of the Resistance Recon Team. As will all figures in the Resistance Fighter range, these figures feature separate heads allowing you to use any head from the range. 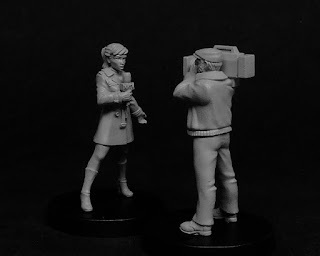 Additionally, the accessories they hold in their left hands - a pair of binoculars and a radio handset - can be used on either figure. To top it all off, the weapon arms are also interchangeable and fully compatible with the Cell Officer Weapons Sprue and the Resistance Cell Officers! The Resistance Recon Team is priced at £9. Purchase two sets for £8 each and three or more sets for only £7 each! 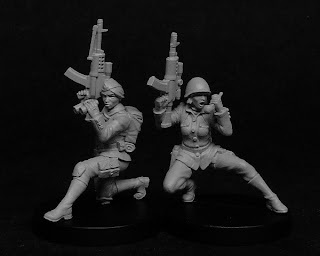 In addition each purchase of the Resistance Recon Team placed up to and including the 31st of July will receive a FREE Cell Officer Weapons Sprue! 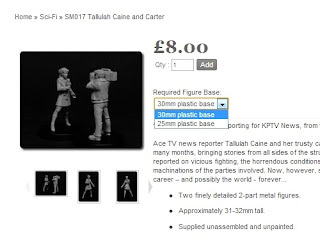 Prior to the new release, I changed the shop product page so customers can now choose between 30mm, round-lipped, plastic bases and 25mm, chamfered edge, plastic bases. The choice can be made using a drop down menu under the Add to Cart button, as shown below. I've noticed nobody is actually choosing the 25mm bases so I wandered if the change had been noticed. 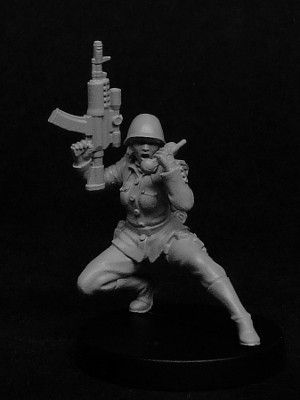 It's no problem if everybody wants 30mm bases, but I'd just expected more people to choose the smaller base! Finally, of the five figures that are to be discontinued once current stock has sold, Kitzie Rama is now out of production. Additionally, stock of Inigo Wilde is low and stock of Havana Gray is very low. Head over to the shop to grab them while you can! That's it for this month, I think. 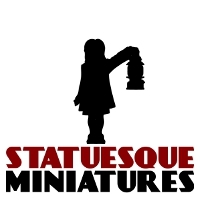 Remember to keep an eye on our Facebook page and Twitter account for the latest news from the Statuesque Asylum!